Well, Dear readers... Now I think I must report that osprey season has ended here in the Twin Cities. My final sighting of the Dad of the rehabbed chick was last Friday. We had some northerly winds that day and I guess he took advantage of that easy ride south to depart. He hung around for a week after the last sighting of his dear chick before he decided he was no longer needed here. I last saw the offspring of the oldest male on Sunday. She was still hollering her head off, which may have meant she knew her Dad was there, but I could not locate him. I visited that nest today and it was so very quiet. Peaceful, still. Her favorite perch in the cottonwood tree was empty. It was a little sad, to be honest. I went around the lake for another perspective and I sat for about 30 minutes, scanning all the trees with my binoculars. Listening. Watching some loons and gulls. No Ospreys. So I will stop my visits for this year unless someone reports a sighting to me. Thanks to all of the dear volunteers who have helped me to watch over this population of Ospreys. I treasure each and every one of you! And thanks to all the people who have hit the "like" button here...each time you do that, it makes me feel that I am doing something valuable. It shows support and I need that. I treasure all my fellow osprey enthusiasts, around the world, who understand how special these birds are. I don't know what the future holds for this project. It's been a tough year financially for me. The number of nests continues to grow, the behaviors are changing and I still see great value in this research, but I need more help to keep it going. I will write a post about all that sometime down the road...but now I have to turn my attention to making some money, selling some pots. They are not all gone yet! I kept checking on the rehabbed chick last week and saw both chick and dad on Friday....but over the weekend, I saw neither. Lo and behold on Monday I did see Dad on his lofty perch. No chick seen or heard tho. Today I went in search of our oldest male, the 22 year old. I arrived to see and hear his one remaining chick on the nest hollering loudly for food. I could NOT find Dad for the life of me. After about an hour tho an adult came flying by, causing the chick to almost have a seizure! But the male went past the nest into a back marsh area to perch where the chick could not see him. After about 15 minutes back there he cruised past the nest again, causing another spasm of desperate food begging. He did not stop, but kept flying off over the trees. The chick waited patiently and quietly. After another 20 minutes, the chick became apoplectic again as dear old Dad came soaring in with a goldfish. He delivered it quickly...too quickly to read the band, but I could see that the color band was on the left leg, which indicated that he was a hacked bird from the reintroduction. He is the only one that is still alive. He scooted off very quickly as the chick dove into the goldfish, looking up occasionally with fish all over his beak, while still food begging. Made me laugh out loud. This old male is not perching in any of his usual perches, and is hard to find these days. I am not sure why, since he has always been a very attentive male, perching near the nest and watching over his kids for most of his life. Maybe he has a new perch that I am just not able to see, or maybe age is affecting his behavior. But he is still providing for this lingering juvenile. At any rate, here we are, on the back side of September, and I was still able to enjoy a couple of hours watching my winged friends. It's not always easy to find them, but there are still some Ospreys around town. I savor these final days, wondering each time I drive away...will this be my last visit with them? I have been back to check on the rehabbed chick every day. For the past two days, she was not seen, tho her Dad was always sitting on his high perch, surveying his kingdom. Today again, I found only Dad, sitting up there and I watched him intently for almost an hour. He preened, looked around, scanning the horizon for his last chick, as if he had far away places in his mind. I am amazed that I can spend so much time staring at a perching osprey, noting all the details of his behavior and appearance...noticing how full or empty his crop is, the various shades of brown on his body and wing feathers, some slightly bleached out, the particular markings on the top of his head, his eye stripe and his breast markings...each osprey, so unique looking. I watch as he closes his eyes briefly for a slight snooze. Did you know they close one eye to rest the opposite side of his brain? Interesting to observe. I notice which direction he seems to look most often...probably where he last saw his chick heading. What is it about these particular birds that captivate me so deeply? I remember at the Raptor Center, when I was training their captive osprey, we called these birds, "heyoka". This is a Lakota term that refers to a special, holy person who does things backwards, a sacred clown, a contrary shaman. 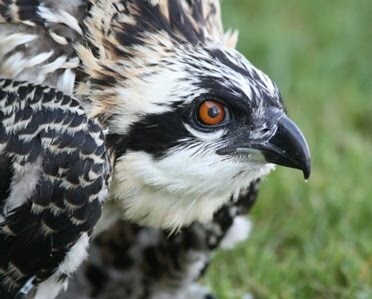 Ospreys are so different than other raptors, particularly in captivity...perhaps that is why I love them. They are like me. I find them completely mesmerizing. I do not like to anthropomorphize, but I can't help but be touched by this male as he balances his pull to head south and his devotion to caring for this offspring, to give her the very best chance at survival, watching over her until the last minute. It's all about survival and reproduction. As I peacefully watched him, I suddenly heard, far off in the distance, that familiar whine of a hungry juvenile. I clapped my hands...she is still here!!!! Weeeeee here she comes, hollering all the way. She landed and I was able to confirm her identity by the silver band that The Raptor Center placed on her left leg. She kept food begging non stop for about 15 minutes, and then Dad took off to get her some lunch. I have watched them enough to know when he goes THAT direction, he usually returns with a goldfish. Any other direction and he is more likely to return with a less exotic sort of lunch. I wanted to wait for his return, but another person scared the chick off the nest and after 15 minutes of no Ospreys, I had to move on. Still, it was a happy day to see them both, knowing I will have so little time left to spend with them. One of my volunteers asked me earlier this season if I had a favorite Osprey. I often do, but it also changes every year, based upon events, circumstances and behaviors. I have to say, as the 2015 Osprey season winds down, I have fallen for this male and the rehabbed adult male that I released. Both of them have displayed such a powerful committment to caring for their offspring....that it has touched my heart deeply. Can't wait to see both of them next spring. Today I stopped to check on the chick that was released from rehab several weeks ago. She has not left the nest much since she returned to the nest weeks ago...but the past two days she was not there. I was not sure whether to worry or not. She certainly needs to be flying, exploring, practicing her water starts etc. The male has been perched very high above the nest on an antenna on a water tower...watching for her almost all the time. Every now and then he would fly off and be gone for a short time, seemingly trying to scare her up. The juveniles will often follow an adult back to the nest, hollering for food. Yesterday his efforts failed when I was watching. Today he flew off and then, back to the nest came my little rehabbed chick, whining desperately for food. Dear old Dad was right behind her, but he returned to his lofty perch, with no fish. It seemed quite clear that he had gone looking for her. He is trying to figure out what he needs to do as well. I am sure he feels the pull to head south, but also feels the strong instinct to care for his offspring. Ah, chick is still here, he needs to stay and feed her. I am pleased that she is still here, but is venturing forth a bit more, practicing some of her osprey skills while Dad is still there to feed her when necessary. It won't be long until these nests are empty and silent. I relish every minute I get to spend watching these last few Ospreys. I will check her again tomorrow. Today I am hanging out at the nest with the rehabbed adult male. I am so happy to say that finally, the female is not around to chase him away, so he is perched near the nest, relaxing, preening. A female chick remains on the nest food begging. After about 20 minutes of hollering, the male heads out to get some lunch. I have not seen the other two chicks. How long will it take this male to return with food for a chick that does not exactly have an empty crop? They are eating machines this time of year...never enough! The male looks good...really somewhat plump for a male! Good to know that he will embark upon migration with plenty of reserves. It looks as if the nest needs some maintenance. Usually the adults bring sticks throughout the nesting season, but this year the unusual circumstances seem to have moved housekeeping to the bottom of the priority list. Many sticks are falling and the nest looks thin on top, but this can be repaired in the spring. After a little over an hour, the male returns with a fish for his youngster. He drops it on the nest and perches nearby...preening calmly. The chick ate, and whined, and then came and landed next to Dad, which made him fly off, and the chick followed. Not sure the chick ate the whole fish...I think she may have dropped it. But they are sticking together, these two. After a short time, the chick returned, alone, to the nest. Dad will get another fish. He is definitely watching over this chick and providing for her very well. The scientist in me just observes and takes notes, documenting the behaviors....but my human heart has fallen in love with this male. I am visiting the nest where the rehabbed adult male belongs. No one was here when I arrived. I waited....answered emails on the iPad. Patience is a necessary quality to have for this work. Finally I hear the distant sound of a juvenile food begging...far off...but getting closer. Finally I see two Ospreys circling high above the nest. The juvenile lands, followed quickly by the rehabbed male who dropped a fish and zoomed off. Yeah! He is still secretly supplying fish to his kids when the female is not around. I have not seen the female today so perhaps she has begun her migration. What a great male...and how lucky that The Raptor Center got him all fixed up. I know you all like happy endings, and this surely is one of those stories. And so very interesting from a behavioral point of view. Still watching, still learning, still accumulating a rich data base in my mind. Apparently I wrote too soon...today I returned to visit the nest where the 22 year old male was missing. I have been to this nest 8 times since Aug 1, usually watching for about an hour or more. I have never seen him, but have seen the female delivering fish at least five times...but today he is here! One chick was alone on the nest when I arrived, quietly finishing the tail of a fish. I waited. Suddenly the young one errupted into hysterical food begging. I checked the old males favorite perch and sure enough, it was him. He ate part of the fish and then delivered it to the youngster in the nest who was almost apoplectic. The other chick did not show up, so must be out of earshot...or on its way south. So I breath a sigh of relief. He may be slowing down in his old age, but he is still here. I am crossing all my fingers and toes that he will survive another migration and set a new longevity record next year by breeding successfully in his 23rd year. How can it be September already? September first brings the beginning of the change here...leaves are starting to turn in some locations, Ospreys are harder to locate, and it's exciting when I can find a whole family, which I did at one nest today! My focus these past few weeks have been those birds and nests that I have concerns about. I have been watching over the rehab birds carefully. Nothing has changed with them...the adult male is still seen occasionally sneaking into his territory when the female is not there, and she still watches for him and chases him away. The chicks seem to be doing allright tho we do see aggression between them, as they compete for food. The young osprey that was returned to her nest is still sticking very close to home...never far from the nest. The male chick and the adult female from this nest seem to be gone. The male here is attentive and is often nearby watching over this chick who has been thru so much. I have been spending more and more time at a nest where one of our oldest males has been for many years. Since The 23 year old died earlier this year, this male has taken the lead, age wise, at 22 years old. Sadly, I have not seen him in many weeks. At first I just assumed it was because he was busy fishing and my infrequent visits just happen to be timed when he was gone. But more recently I am seeing the female bringing all the fish, and it is time for her to leave, but she remains, apparently trying to care for her chicks single handedly. This male used to be a very attentive male, easily found in one of his favorite perches, but now I am unable to locate him. It is becoming increasingly clear that we may have lost him. It's so hard to not know what happened to him. I also received the sad news that our oldest banded female, 21 years old, has died. Her nest failed this year for reasons that were unclear to me...incubating one week and then gone the next. I have visited the nest often hoping to see her and her mate, but the nest remained empty. Then her band was discovered recently on the ground below the nest. There was no body found. I suspect she died a long time ago, and perhaps her death was the reason for the nest failure back in June. I have known both these birds for so long that they are like family to me. They both had long and very successful lives and it honestly feels like just yesterday that I first met them, read their bands and did drawings of their markings...but it was over 20 years ago. The memories of those early days flood my mind. As I checked nests today I stopped at another nest, hoping to locate all the chicks and was skunked on that effort, but I saw an adult sitting in a tree and I set the scope on him....ah, another one of my old friends! This fellow is now our oldest male at 21 years of age. It did my heart good to watch him, sitting quietly, snoozing, watching fish in the water and just peacefully watching over his territory, with no chicks hollering for his attention. I reviewed his life in my mind...so different from the other two males who we seem to have lost this year. This guy nested at only one nest as far as we know. When I first began this research, someone else was monitoring this nest and for several years he reported a banded male but said, " you will never be able to read that males band". To me, that was like throwing down the gauntlet! I was determined to get this band read. I can't STAND an unread band! I hiked out to his nest, sneaking around behind trees, so as not to frighten him away...but in the end I just walked out there, sat down and he showed me his band, and he has done that every year since! (These birds often cooperate with me.) He has had a variety of different females...I will have to look up his history and count his mates. He has produced many offspring. Another very reliable male. I pondered the losses this year, wondering if I will see him next spring. So many changes politically, so many people moving onto other phases of their lives, so many properties being sold, development changing the habitats, the banding being largely eliminated...it all makes me sad, frustrated that I don't have the money to do what I would like to for these birds, this research. What will 2016 bring? Will we find the help we need, will the right people show up, will people start to recognize the importance of maintaining these nest sites, habitats and continuing the research and banding? Time will tell. For now, we begin to say our goodbyes to our osprey friends...old and new.